The first time Samuel L. Jackson appears in Unbreakable, M. Night Shyamalan’s majestically moody turn-of-the-century spin on the superhero origin story, he’s waxing rhapsodic about comic books, with all the command Jules Winnfield reserved for imaginary Bible verses. Comics are real art, and not just for kids, lectures Jackson’s character, Elijah Price, a collector with exceptionally fragile bones who turns out, in a classic Shyamalan twist, to be the film’s stealth criminal mastermind—Mr. Glass, as his childhood classmates called him. Much has changed, of course, in the two decades since the writer-director set out to prove his villain’s thesis, to make a crime-fighter opus that took the genre seriously. Superheroes are now the dominant force of Hollywood entertainment. No one needs to be told that they’re not just for kids. If Unbreakable was ahead of the curve, arriving as it did on the cusp of the superhero-movie boom, then Shyamalan’s belated new sequel, Glass, is perversely and even admirably out of step. Like a lot of modern superhero stories, it takes place in a shared “cinematic universe”—which is to say, this isn’t just a follow-up to Unbreakable but also to the filmmaker’s last movie, the multiple-personality thriller Split, whose twist ending teased an eventual standoff between the main attractions of both pictures. But beyond the franchise-uniting aims, no one would confuse this often goofy, sometimes clever riff on cape-and-cowl mythos—featuring only stray flashes of action, few special effects, and even fewer locations—for anything off the Marvel assembly line. For better and worse, it’s unmistakably a Shyamalan movie, with all the clunky plotting and robust, idiosyncratic staging that generally implies. Left to rot in a padded cell and under heavy sedation since the events of Unbreakable, Jackson’s Elijah—a mass murderer who created disasters to flush out his heroic opposite—doesn’t show up until roughly the second act of Glass. His one-time friend/nemesis, indestructible family man David Dunn (Bruce Willis), has kept busy over the 20-year interim, running a home-security business by day, using his powers of supernatural intuition to hunt down bad guys by night. The film opens with David, who the internet has taken to calling The Overseer—just one nickname he’s earned in his years of vigilante justice—searching for Kevin Wendell Crumb (James McAvoy), the severely schizophrenic serial killer of Split. Having once wrestled for control of the “light,” the various personalities within Kevin’s splintered mind now mostly answer to his most homicidal self: The Beast, a monstrous alter ego who seems to grant Kevin superhuman strength and agility whenever he’s in the driver’s seat. It isn’t long before these forces of good and evil collide. But no sooner do David and Kevin find each other than they’re both captured and placed, alongside Elijah, under the supervision of Dr. Ellie Staple (Sarah Paulson), who specializes in the study of people suffering from what she essentially describes as a superhero complex. Most of Glass takes place within this single setting, a less-baroque Arkham Asylum, where the doctor tries to convince three living archetypes that their powers are all in their heads. 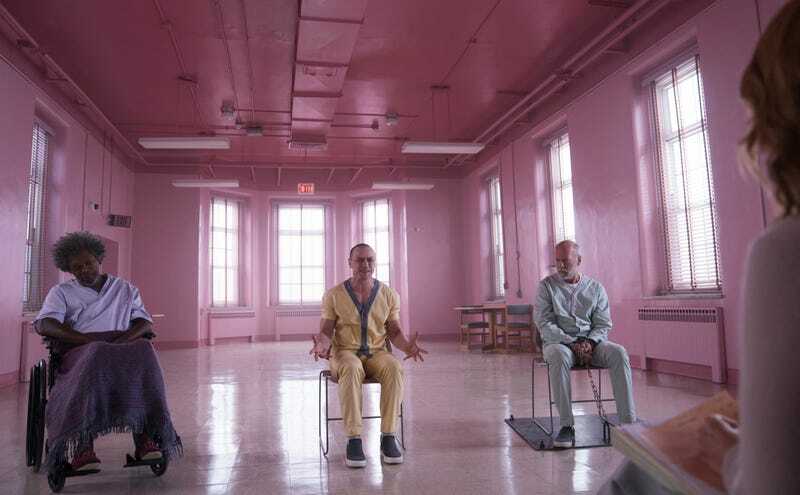 Operating again in something like a B-movie mode, Shyamalan condenses the genre to its psychodramatic essence: The big set-piece here isn’t a fight but a group therapy session. The MCU has largely turned superhero cinema into a clash of personalities, but Glass, which is somehow smaller and wackier than Unbreakable, makes that literal—particularly in the case of “The Horde,” the doomsday cult within Kevin’s head, waging its own Civil War for control of their shared secret identity. McAvoy, by the way, kills it again. There are no diminished returns in his vocal and physical tour de force, flipping on a dime from one distinct “character” to the next. Is it any wonder that Glass, like the Tim Burton Batman movies, is much more interested in its bad guys than its good one, especially once Elijah stirs back to life, awakened like The Joker in The Dark Knight Returns by the reappearance of his adversary? For however much he scales the genre down—this is a superhero movie that takes place mainly inside one building—Shyamalan grasps its pulpy appeal. More than the average blockbuster custodian, he possesses a style compatible with the exaggerated visual language of comics: Working again with cinematographer Mike Gioulakis (It Follows), the director uses silhouettes, reflections, and oddball angles to evoke the panel-by-panel spectacle of the medium, while color-coding his main trio in suggestive shades of green, purple, and orange. One is reminded throughout why Shyamalan once earned comparisons to Spielberg and Hitchcock: Like those storyboarding wizards of pop-film craft, he makes every shot an event. As a writer, however, he can still be remarkably clumsy. Inelegantly tying together the plots and mythologies of the two previous films, his script for Glass struggles to balance its cast of characters, including teenage Split survivor Casey (Anya Taylor-Joy) and David’s now-grown son, Joseph (Spencer Treat Clark, reprising a role he played 20 years ago). Most critically, Shyamalan can’t seem to figure out what to do with his hero—and by extension, with the increasingly grizzled Willis, whose sleepiness here serves only to highlight the nuanced understatement of his work in the first film. That’s true in general of Glass, which keeps triggering memories of Unbreakable—most blatantly by actually repurposing deleted scenes from it as flashbacks, an admittedly ingenious device—without approaching its power. In hindsight, that deliberately paced thriller, labeled a disappointment after the overwhelming success of The Sixth Sense, looks like Shyamalan’s most resonant entertainment. It found a stirring human story, one about the need for purpose and meaning, in the standard discovering-your-powers arc of a comic-book origin story. There’s nothing so affecting lurking in the convoluted upshot of Glass, whose generic instruction to believe in what makes you special feels airlifted out of The Incredibles, a very different postmodern superhero story. It all builds to a twisty retcon and a bizarre, almost abstract climax, when Shyamalan finally delivers a little conventional bam-pow spectacle, only to undercut it with what feels like a parody of Unbreakable’s explicit commentary on comic-book narrative: Here, everyone seems to have picked up Elijah’s annoying habit of explaining the mechanics of superhero stories aloud. Maybe there’s a hint of sly satire in that choice—a dig at the cultural ubiquity of these things, the absurdity of overanalyzing them, or the way Elijah’s defense of comics as a serious medium now rings out from every corner of the web. Or maybe it’s just bad writing. 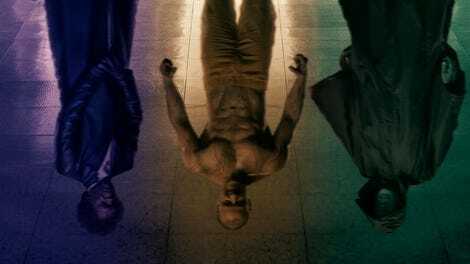 Either way, Glass, for all its flaws, at least shatters any notion of how a superhero movie has to operate. With more of these coming every year, that’s an achievement worthy, at least, of a celebratory Sam Jackson monologue.